This is the page your subscribers will be directed to, right after they click that “Submit” button on your web form. It’s best to have this page confirm with your subscriber that their details have been successfully submitted – and you can thank them, too, while you’re at it! If you simply redirect them back to the same page they were on, however, they won’t get any feedback that they signed up successfully – and after all, this is the ‘confirmation’ page. So, once you have that page created on your site, just paste that URL right into this field, here. Remember: if you have your web form set up as a double opt-in form, you should also include instructions on this page for your subscribers to check their email for your confirmation email. 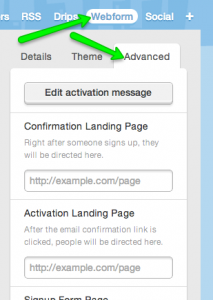 This option is only relevant for forms that are set to double opt-in – that’s the only time you need to consider setting an Activation Landing Page. This is the page that your subscribers will see after they click on the confirmation link that they receive in their emails. If your web form is set to single opt-in, and folks are added to your audience immediately upon submitting their details, then this landing page will never be seen by anyone. Again, if you don’t put anything into this field, then your subscribers will still see a nice Mimi “Thank You” page, after they click that confirmation link. But, if you’d like to have your readers see a page of your own, then this is where you put the URL for that page. Maybe you want to specifically thank them, in your own words. Or, maybe offer them a free gift for signing up – just publish that download link on a page, and set that as your Activation Landing Page. 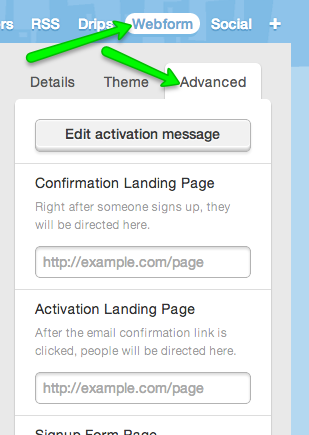 Now, go out there and customize your web form’s landing pages!